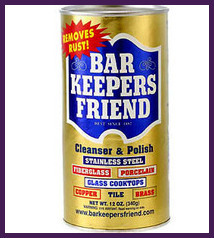 Bar Keepers Friend is one of those must-have-items that everyone should have on hand in their homes. Just about everyone who uses it swears it is a miracle worker and some people even go into a mini-panic if they find they start running low on their supply. It works well for cleaning so many things that other basic cleaners can’t seem to handle, yet it is less abrasive than products such as Ajax or Comet. Bar Keepers Friend is available in most major supermarkets in the cleaning section or you can easily purchase it here. While there are two types of cleansers available – the powdered version and the liquid version – it seems that most users consider the powdered version to be more effective. There are two different techniques to using Bar Keepers Friend as listed on the canister. You can choose to sprinkle it on a damp cloth for smaller messes and stains (such as you would with a cleaner like Ajax), or you can make a paste of it with a little bit of water and let it sit for a few moments on more stubborn scratches, stains, rust, etc. Here is a list of things that Bar Keepers Friend is known for being particularly good at cleaning, though it appears that people seem to find new uses for it daily. Barbeque Grills – A great grill cleaner for outdoor barbeque grills. Burnt Food – Great for cleaning burnt food on pots, pans and ceramic stoves. Cookware – Especially good at cleaning and shining pots and pans made of copper or stainless steel. Showers – Perfect as an all around shower cleaner because it cleans showers made of fiberglass, acrylic, ceramic tile or porcelain tile. It also cleans mildew, tile grout and even glass shower doors. Sinks – Works especially well on stainless steel sinks. Manufacturers do not recommend most bleach products to clean stainless steel, but Bar Keepers Friend is both safe and effective and cleaning stainless steel is actually one of its most popular uses. It also works well for cleaning copper, bronze and brass sinks. Tiles – Safe for cleaning both porcelain and ceramic tiles. Toilet Bowls – Great for cleaning toilet bowls with no harsh chemicals or overly strong odors. Tools– Helps remove rust from automotive tools and gardening tools getting them sparkling again. Yellow Stains – Works well for removing yellow stains from clothes (just be sure to check garment label first).